Chelsea Art Society Show at Chelsea Town Hall. It is a beautiful building with windows and windowboxes all across the front. 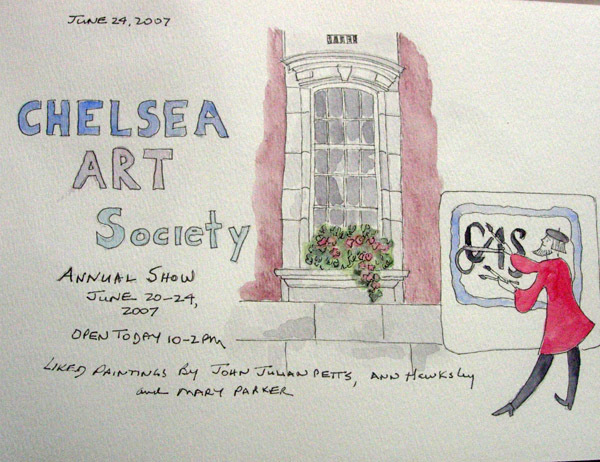 The show was interesting and I found 3 artists who I liked - each of whom had done paintings of our area of Chelsea. A walk along King's Road in Chelsea - with a local bus, Pizza Express, and Boots Pharmacy. I will miss our daily walks on King's Road with my daughter and our grandchildren. Really wonderful sketches, Shirley. You've captured that rainy London feeling. Sorry the weather wasn't good - it's been terrible here in France as well. Glad you're still managing to enjoy the trip despite the rain - it keeps raining here in Ipswich too. Before my trip to Europe, with London being our first stop, I'll need to get a list of places to eat or not miss! First on my list is where to grab a good morning cup of coffee! 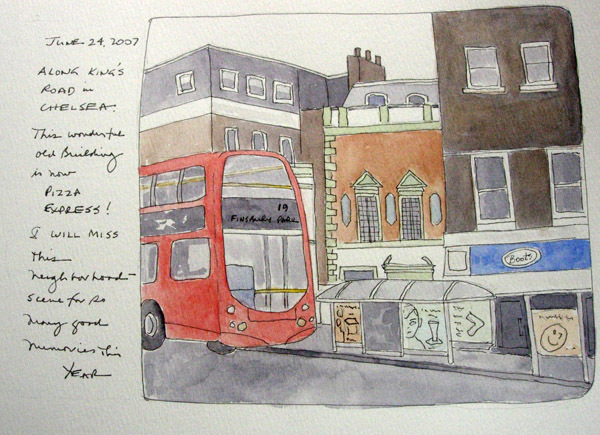 Your sketches from London are worthy of a travel book...I bet you have enough to put one together! I can't wait to put paint to paper throughtout Europe in October! Beautiful sketches! Sounds like you had a great time! That's so cool! I've passed this scene so many times! The Chelsea house looks absolutely gorgeous. It must be one of the nicest places to be in London, you were so fortunate.